Ten years ago computer-generated images were used primarily by UK based property developers, these were simple 3D exterior renders. Advances in software and skills now mean some are so good that it is hard to distinguish them from actual photography. Off plan visuals have become an essential part of marketing new build properties, with pretty much all developers benefiting from selling their real estate before the ground has even been broken. We know that good architectural visualisations need to say more about a home or building than which brick goes where; which is why we strive to create stylish and engaging marketing visuals of exterior and interior spaces to excite and encourage new build property buyers to purchase off-plan. It’s vital to our clients that their marketing campaign speaks to the right audience and we pride ourselves on being able to tailor exceptional visuals with our range of CGI services. Every detail we incorporate into our images, small or large, combine to create an overall ambiance. It could be the time of day or even year, the trendy bustling urban street or the laid-back family neighbourhood. It may be the feeling you get arriving back to the perfect dream house, the kind of lifestyle new home owners aspire to or simply keeping the focus on desirable features of architecture. Our productions enhance sales centres, brochures, websites and social media adverts. Every last detail in our delivery is executed with absolute care and accuracy to benefit our client's requirements. Modern interior design is about much more than how a room looks, leading designers such as Ilse Crawford have inspired work to compliment architecture while putting the every day needs of people first to create atmospheric but usable spaces. This empathetic approach brings humanity into interior design; creating more of a feel than a look. This is more important than ever with more clients recognizing the lifestyle benefits of design focused on our well-being with philosophies such as the Danish ‘hygge’ and the Swedish 'lagom' becoming increasing relevant in our culture. We aim to replicate this in all of our CGI whether it be residential or commercial new-build properties going to market off-plan; or a requirement for a virtual room set to show case a new range of products within magazines and online. Increasingly interior designers and marketing agencies are coming to us to produce bespoke 3D visualisations featuring products, furniture, finishes and lighting either for the end client to approve before proceeding with expensive builds or simply to be used to market a new property, venue or product to the public. We can work from existing mood boards and style reference to visualise existing concepts, alongside you to help develop a design idea in it's early stages or simply take the lead producing a bespoke mood board which we can then to the next level by producing photo real CGI to impress and bring a vision closer to reality. Grand palaces, beautiful cathedrals and famous castles have stood strong for hundreds of years adding character and interest to our streets and landscapes. Old industrial mills and derelict factories find new life when converted into sophisticated and stylish apartments and trendy work spaces; barns are converted into venues for life's celebrations and spacious but cosy family homes. Modern sky scrapers and world leading stadiums make for awe inspiring cutting edge architecture catering for our work and leisure while acting as symbols of progress and success. The designs of today's architects may still be here long after we have all gone, which is just one reason why off-plan 3D visuals act as a vital tool for all new architectural projects, whether it be a single architect designing a new extension for a local family or a large scale urban architectural practice working on the regeneration of an entire neighbourhood - architectural visualisation has become an essential part of the process. Working from an architects drawings we produce accurate and impressive CG visuals to aid the planning, design and public consultation processes. 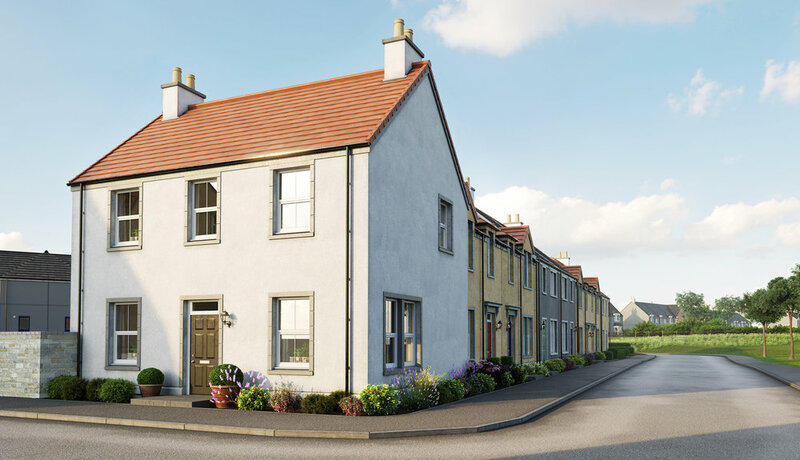 The high quality of our renders is such that in the later stages they are used for marketing in high-end glossy brochures, on dedicated websites and even to secure financial support from large investors. Our exterior and interior visualisations of architecture can be produced before the first foundations have even been laid. We produce entire 3D virtual room sets for Kitchen, Bathroom and Bedroom manufacturers allowing products to be showcased without the inconvenience of an expensive physically building a set. There is no limit to the type of product we can visualise; we work with many manufacturers helping to feature new and existing products in their best light and aspirational spaces. These product visualisations can be updated to meet future tastes and requirements at a fraction of the cost, months and even years down the line. Without 3D sales visuals it can be tricky for anyone to envisage the layout and feel of a new housing development. We can produce the full range of visuals from 2D site and floor plans to street scenes and bird's eye views, not only making the sales and marketing of a development a cinch, but also giving peace of mind to the buyers of a new build property.